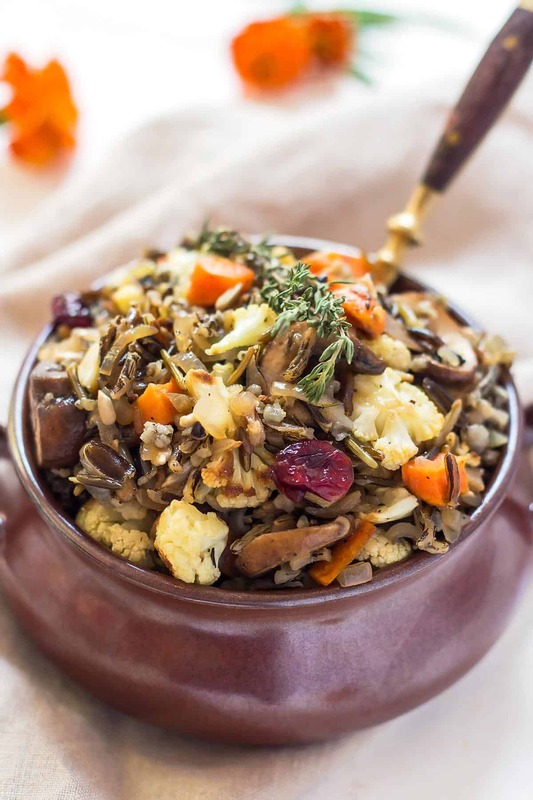 This delicious breadless gluten free stuffing that is made with wild rice, mushrooms, and roasted cauliflower. While it skips the bread cubes this vegetarian stuffing is on point in the flavor department. It can easily be made ahead and simply reheated to free up your time for other recipes on Thanksgiving day. Personally, I have never been a big fan of stuffing. I love the rustic flavor, but the texture of the cooked bread cubes just isn’t my thing. So I set out to make a breadless stuffing that still has all the right flavors. This gluten free stuffing recipe consists of three parts. This may sound daunting at first, but two are practically hands-off, so you are not actively working on this recipe the entire time. Start with putting on the wild rice to cook. You can do this either on the stove top or in an appliance like the Instant Pot or a rice cooker. 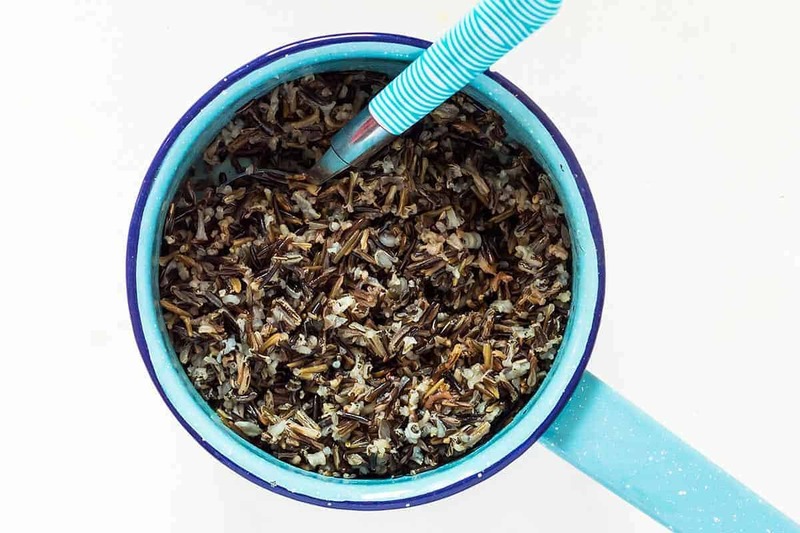 You can use either straight up wild rice or a rice blend that includes wild rice. Use vegetable stock instead of water for extra rich flavor. 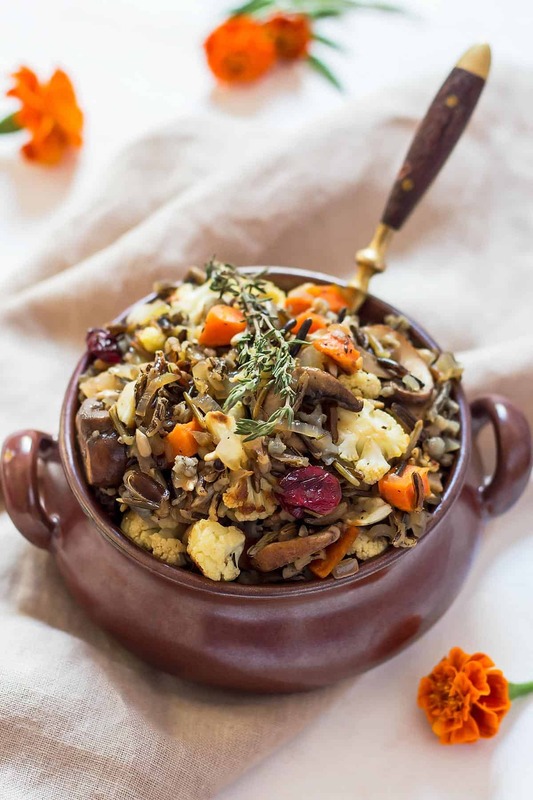 Cooking the rice takes the longest, freeing you up to prepare the next steps for this wild rice stuffing recipe in the meantime. For the finished vegan stuffing to be more uniform, I like to use fairly small sized cauliflower florets. To achieve that I simple pull them apart into smaller pieces. I find that using my hands instead of a knife makes way less mess and waste of cauliflower crumbles. I also use the stem parts, which I then cut into smaller pieces with a knife. Drizzle the cauliflower florets and carrot pieces with olive oil and season with salt and pepper. Place them on a baking sheet and arrange sprigs of fresh thyme and rosemary on top. Roasting the vegetables with the herbs gives this dish its signature Thanksgiving flavor. Stir the vegetables half way through roasting. After roasting, pull the tiny leaves off the herb stems, and coarsely crumble them with your fingers. Then combine them with all of the other ingredients. 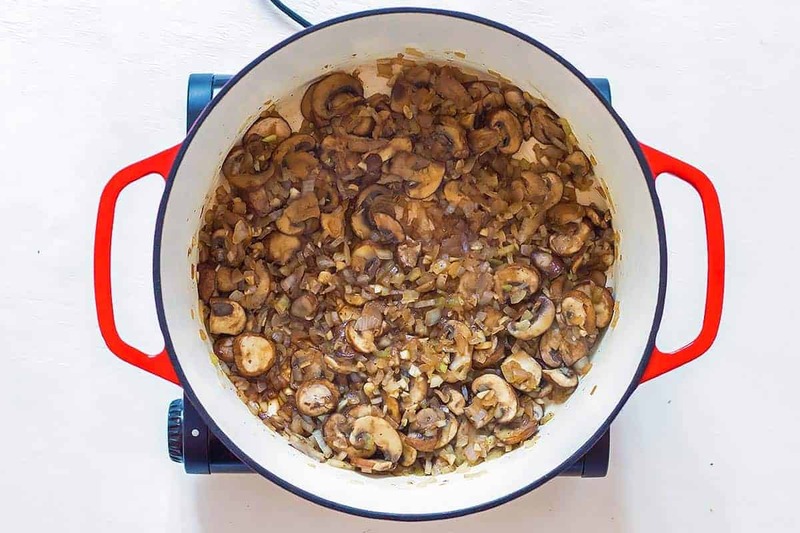 Sauté the mushrooms together with onion and garlic until they are softened. Use a large saucepan or Dutch oven where you plan to combine all of the other ingredients for the gluten free dressing. The mushrooms only take 7-10 minutes, so I start with them when the rice is almost done and just before the vegetables finish roasting. I like to use brown cremini mushroom for a deeper and richer mushroom flavor. If you prefer a less bold mushroom flavor, use white button mushrooms instead. At the end of sautéing, deglaze the pot with a tablespoon of balsamic vinegar (broth or cooking wine can also be used). I do this to make sure I can get all of the browned mushroom flavor and also scrape the bottom of the pan to loosen up any stuck on bits. Now the mushrooms are ready to be combined with the cooked wild rice and roasted vegetables. If you like, you can also add dried cranberries and/or sunflower seeds at this point. Yes! I actually recommend making this mushroom stuffing a day (or up to 3) in advance. It reheats beautifully with a drizzle of oil in the bottom if either a saucepan or deep sauté pan. 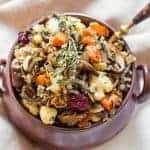 On Thanksgiving day or whichever other day you want to serve this vegetable stuffing, you’ll have plenty of other things to cook and prepare. And don’t forget that socializing with family and friends and also just taking some time to relax are just as important that day. When to stuff a turkey or other bird? I think I am with Alton Brown here. I would prefer cooking and serving this gluten free Thanksgiving stuffing separately. But if you really must stuff it inside a turkey or another roasted bird, do so while it is resting after it has finished roasting. The cooking juices will accumulate during this resting period and nicely flavour the gluten free turkey stuffing. Let me repeat though, that it is not necessary to add this stuffing to a turkey. It can be cooked completely separately. But is it still called stuffing then? Aren’t we on dressing territory now? Let’s have a closer look at terminology. Yes and no. Many think that stuffing and dressing are the same dish, only that stuffing is cooked inside a turkey while dressing is cooked separately. But it is not actually so much about a difference in cooking method, but rather a regional difference. While in most of the United States stuffing is the more common and preferred name, in most Southern states the term dressing is used – whether it’s cooked inside or outside of a turkey. Apparently, the term stuffing just wasn’t seen as polite and proper there, so they used dressing instead. In Canada I have only ever heard the term stuffing used. Yes, you can freeze this cauliflower stuffing. Whether you are prepping really far ahead or want to save leftovers for another time, freeze the stuffing in an airtight, freezer-safe container for up to 4 months. When ready to use, let it thaw in the fridge overnight, then reheat in a saucepan or sauté pan with a drizzle of olive oil at the bottom. How much wild rice stuffing per person should I plan? Considering there are many other main and side dishes as well as dessert, I find that a 1/2 cup serving per person is plenty. So this recipe makes about 12 servings. I really wouldn’t recommend making a half batch even if you have a smaller holiday gathering. Just freeze any leftover stuffing as instructed above and use anytime in the future when you need a side dish. I love roasting vegetables and do so several times a week. That’s why I love to have several trusty baking sheets on hand. For sautéing the mushrooms and combining all other stuffing ingredients I used my beloved Marquette Dutch Oven. A delicious gluten free stuffing that is breadless. 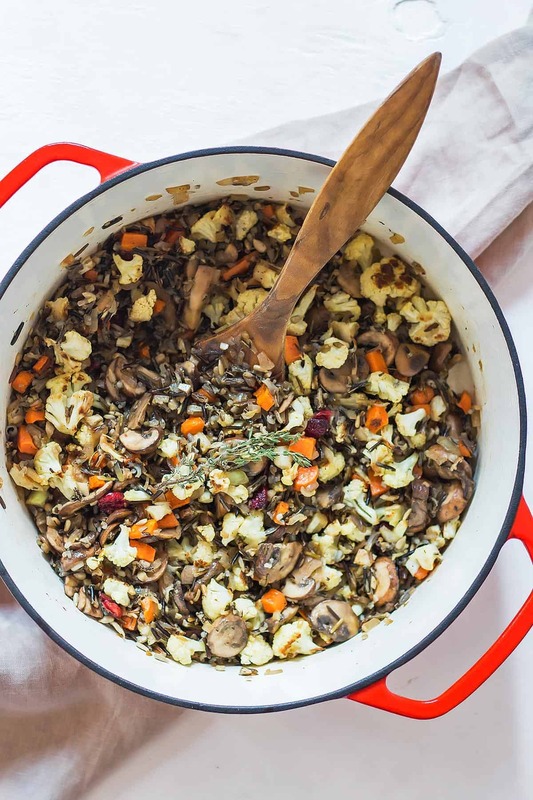 It is made with wild rice, mushrooms, and roasted cauliflower. While it skips the bread cubes this vegetarian stuffing is on point in the flavor department. It can easily be made ahead and simply reheated to free up your time for other recipes on Thanksgiving day. Cook the wild rice according to directions. Use broth instead of water for extra flavour. Preheat the oven to 400°F. 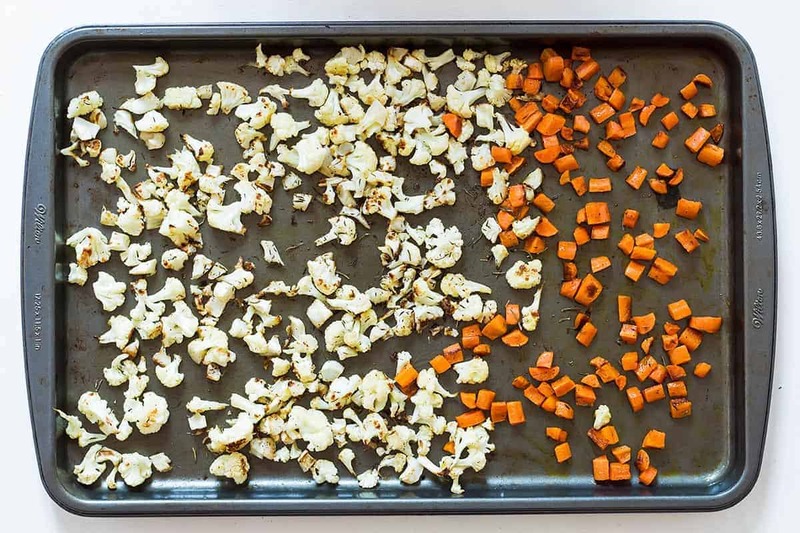 Place the cauliflower florets and chopped carrots on a large baking sheet. Drizzle with about 1 tablespoon of olive oil, season with salt and pepper and toss to coat all the veggies. Arrange the thyme and rosemary sprigs on top of the veggies, then roast them for 20-30 minutes until softened. Stir once halfway through roasting. In a large pot heat the remaining tablespoon of olive oil and the butter. Add the sliced mushrooms, onion, and garlic and sauté them on medium-low until tender. Deglaze the pot with the balsamic vinegar. Scrape up any stuck on bits. Add the cooked wild rice and roasted vegetables to the mushrooms. Rub the small herb leaves off the springs and add to the stuffing. If desired, also stir in dried cranberries and sunflower seeds. 1. Serving - This delicious vegetable stuffing can be enjoyed as a side just as is. You can also prepare it the day before serving. Simply reheat it in a pan. 2. Stuffing - If you really want to add the stuffing to a turkey or other poultry roast, I suggest doing so after the bird has finished baking. Add the stuffing while the bird rests for its juices to meld with the stuffing.